Entering the bustling coastal town of Ballito on the KwaZulu-Natal North Coast, pedestrians are welcomed by the recently completed walkways of practical clay pavers that add rich colour and contrast to create a quality urban environment. Dave Duke, General Manager of Urban and Social Development Africa Division for SMEC South Africa, said the project, which started in August 2014 and completed on 18 June this year, was essential for the area. “Ballito has experienced phenomenal growth in recent years and required a major road and sidewalks upgrade to provide for increased traffic and ensure pedestrian safety,” explained Duke. “The transformation of the old low-volume, rural-type access road into a new, urban environment required improved aesthetics. A herringbone pattern was selected because of its increased interlocking strength ensuring that the movement of the pavers is limited and the risk of pavers shifting or lifting is reduced,” he said. 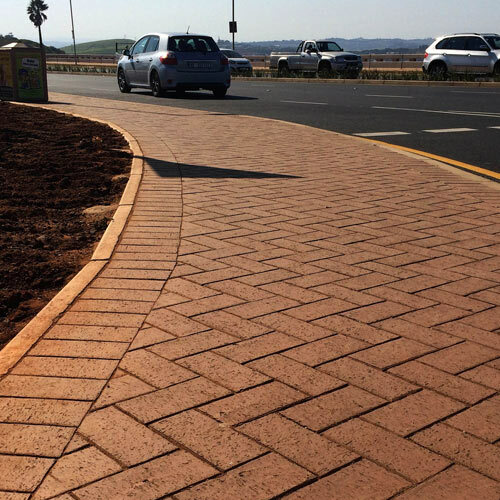 A total of 3 600 m² Burgundy pavers have been used to construct the sidewalks and islands along both sides of Ballito Drive, extending from Greenfields Road near the new N2 interchange, all the way to the M4 intersection. Corobrik’s Director of sales Allin Dangers, said the clay pavers were the perfect choice for an outside area that will have to endure high levels of foot traffic. He said clay pavers are also a safe choice as they are smooth so easy to walk on and skid resistant in wet weather. Zayne Sayed, Contracts manager for Afriscan appointed Advanced Retaining & Paving Systems to install the pavers. Sayed said that the main challenge was to ensure the safety of the pedestrians while working. The construction team needed to remain focused on the work during the period of high traffic volumes in Ballito.